We picked up two new sports goods in the last few weeks. One was a baseball glove. Dada plays in a community softball game Friday nights that has peeked BigE's interest. So we both have new gloves. 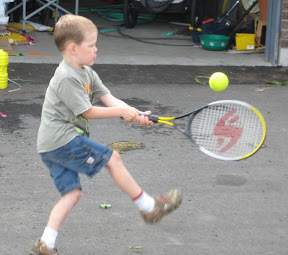 In addition BigE had fun with rackets at a pool party a while ago and wanted to get tennis rackets. He'd played with a neighbours before. Through the power of WalMart's pricing we picked up a racked each for $8.50. Hard to go wrong with that. So now we are out in the driveway hitting balls back and forth. After a few days we've started to be able to get a couple of hits back to back. Although most balls end up in the street. 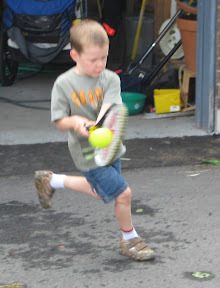 And yes I have figure out how to do the action shot turned on the new camera. Posted by PB at 10:13 p.m.